After a couple of weeks of being able to do nothing but hexies I desperately wanted to start a new quilt. I do have a large number of quilts to finish but I just had to do something new to blow out the cob webs. So last week when I was feeling better I started going through my Bloglovin feed and found two projects that I just feel in love with. First there was Cari at There’s a Thread fabulous tutorial for making a Palatina Pillow. Then I found Amy at 13 Spools interview with Faith from Fresh Lemons, which included a photo of a wonderful poinsettia mini quilt (link here). These two projects inspired me to make my own version. The block was designed as a 4 x 4 inch block, the size I usually work with, but for this quilt I blew it up to 7 x 7. Blowing it up was as easy as selecting “scale to page” on my printer and then trimming the block using my ruler’s 1/4 inch mark rather than the dotted lines. For me this is the perfect block to be working on at the moment, as you actually have to plan out the quilt little. So I have pulled out my colour pencils and have been pre-marking my paper patterns, block by block. To make this pattern work how I wanted, you must have blocks that match up, hence the pre-colouring! As I am still unable to sew for long stretches and this process allows me to take breaks and go slower than usual. When I put the blocks I have done so far up on the design wall I realised that there was another influence at work… my hexies. I just can not seem to avoid them at the moment! This is great! I love how you use black and white prints. I may have a bit of a black/white addiction at the moment. I love how it makes colours pop. We would love to put one of tour free patterns in our newspaper! Or perhaps feature a different one each issue. Harriet. Please let me know where I can email you. That looks like pretty cool pattern. I like your color combo and I’m looking forward to see some more! Love the block and your hexies. Bright colors just draw me in! I love both of your projects! Very cool paper pieced pattern! This is so cool! Putting stars in the intersections is really clever. I really want to see it made up into a full quilt now! Great block and beautiful hexies!! Pairing black and white prints with bright colors has been a favorite combo of mine lately!! Premarking the paper is smart – I like the start you have going on. 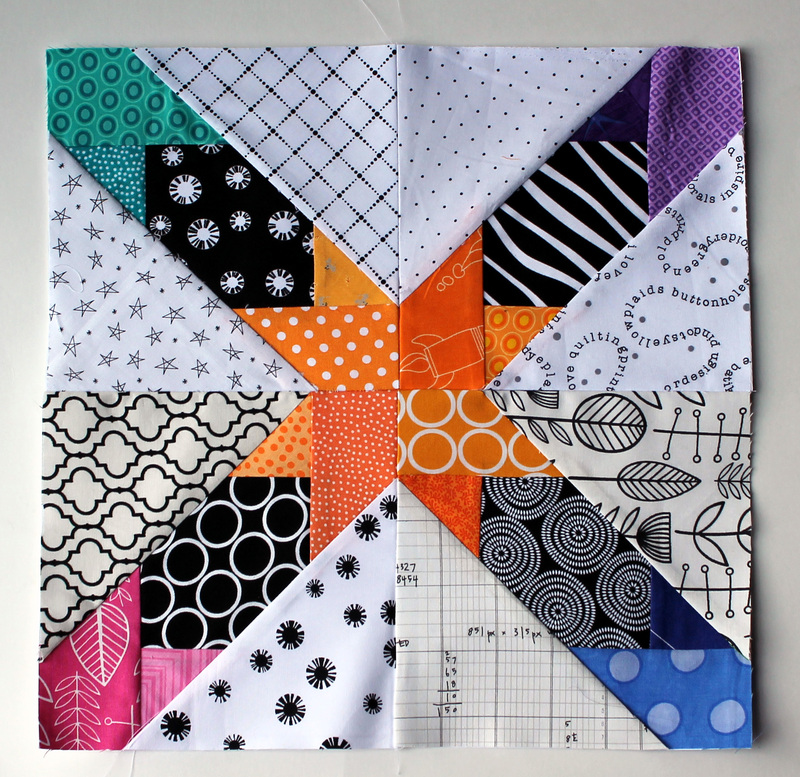 I am so fond of your Monday paper piecing segment! I recently just took the plunge Ino paper piecing myself and I couldn’t be more smitten..that is until I saw this beauty! This is officially on my To-Do-Now list! Thanks for the beautiful inspiration! So clever! I appreciate the time you take to consider and plan the design! OH! Those hexies are way too cute! 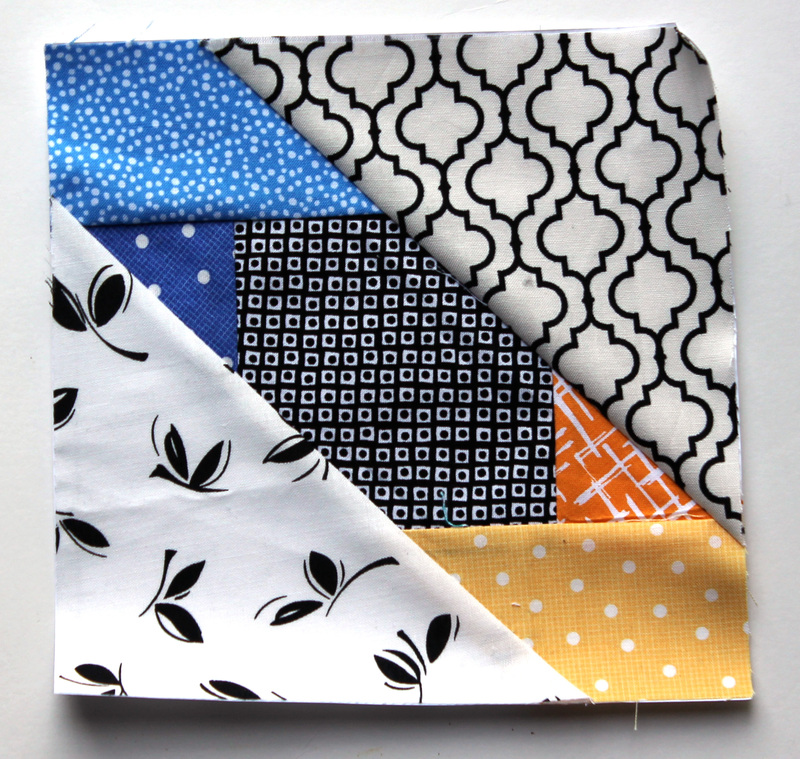 I adore the fabrics you chose for the block you designed. SO awesome. Very striking! I thought at first it was an X + block, but it’s much more intricate. What a great block! You have a great collection of fabrics. I do love scrap quilting and I am happy to rummage thru remnant bins and friends scrap bins. I have no dignity really when it comes to fabric. visiting from WIP Wednesday. I love all these. The black and white makes it pop. Welcome. I love wip Wednesday because it forces me to take stock every week and is a fun part of my blogging schedule. I find so much inspiration from what everyone else is doing. Love those black and white backgrounds and really the block is just awesome! 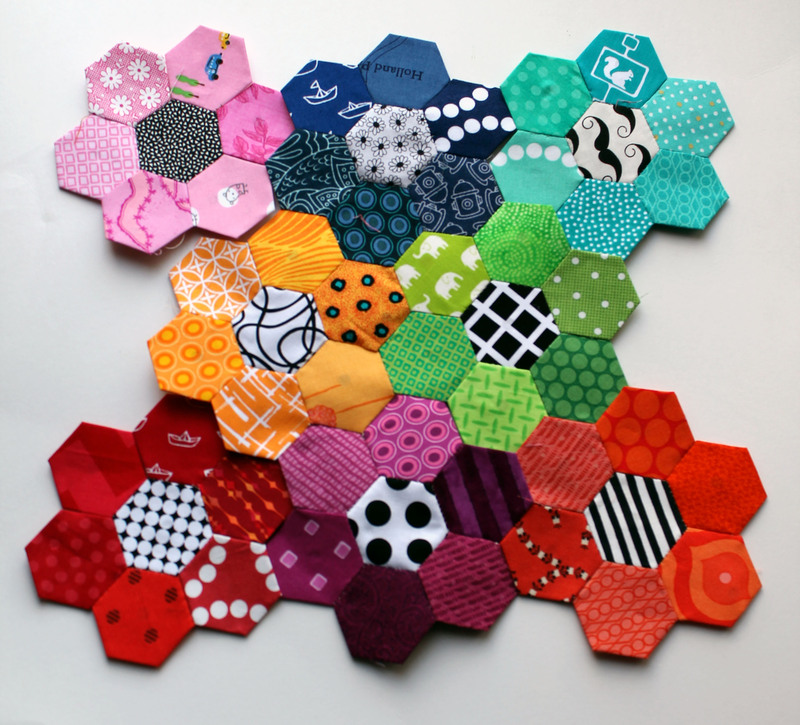 And the hexies, oh the beautiful hexies…. That first block is fantastic! What great colors! 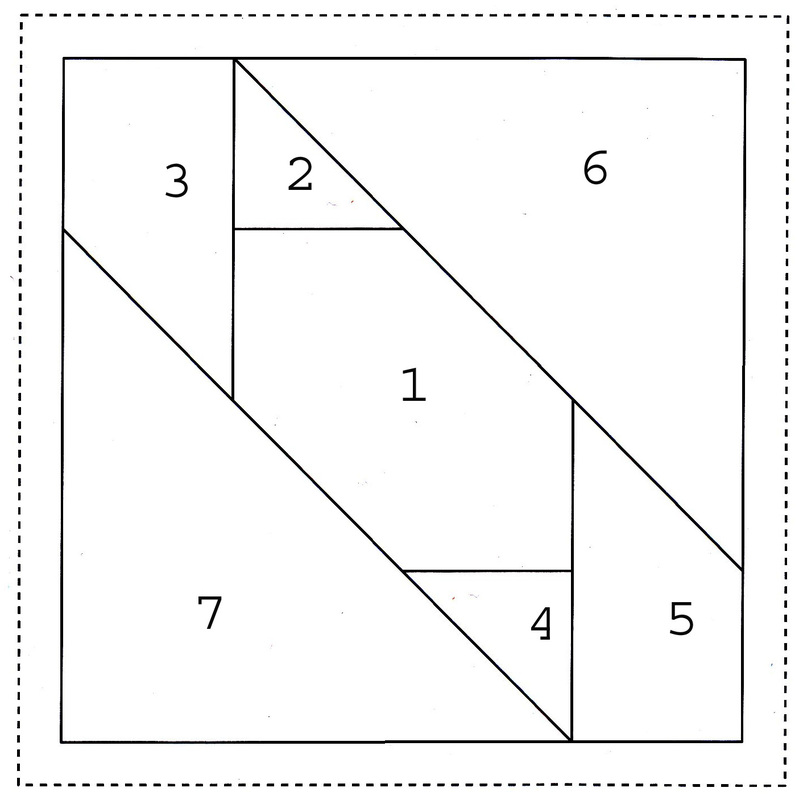 That’s a really creative block – so cool that you designed your own paper piecing foundation! Love that text print too. It’s adorable. Stop. Cath. You have got to just stop it. Your use if color and the way you out fabric together makes me want up sit at the sewing machine for hours. You have such an eye and I love being your blight friend bc you inspire me!!! This is beautiful. Glad you are back at it- full force, girl! Thanks Ashley. Though I must admit I am at 50%. Can still only do short stints at the machine. The break though has been great for generating ideas. Your new project is going to be stunning! What a stunning block!! I can already imagine the other coloured stars coming off it!! I love that block! Especially the colors! Great job making your own pattern! Those hexies are adorable too I can totally understand why you can’t stay away. That block is fantastic! Really love it. And I also love your hexies! Great work! I need to have you fabric shop for me or maybe pick out the fabrics to use in my blocks–your blocks are always so gorgeous and full of color. Thanks for the compliment Laura. I really do love to play with colour. I must say I find myself shopping for fabric colours more and more these days as opposed to specific fabric lines or designer (exceptions to that rule are anything by Heather Ross, Lizzy House or Denyse Schmidt and the Architexture line!). I can not pass up a Fabric.com sale for my neutrals – black/white, grey, navy and whites. And I love spending hours at my local fabric stores finding the rest. I love variety so I buy a lot of fat quarters and quarter yard cuts. The best thing though is raiding my friends scrap bins. I have understanding and generous friends. That star block pattern is AWESOME! I totally want to try that! My mom wants to do this pattern, and is wondering if you have written instructions somewhere (and how much of each print you used). Have you formally published this pattern? I’m attaching her contact info here. I LOVE your work!!! 😊 you do such beautiful blocks & you are do generous with all your free patterns & info! I look forward to seeing your quilts in the future! Hello Cath, I am SO inspired by your creative projects! I am going to try the Star string pieced pattern. On this page, you mention it was created for your usual 4″ block and you blew it up to be a 7″ block by selecting scale to page. I scaled it up to 100% and when I print it and measure the block, I get 6 – 13/16 from solid line across to solid line and 7 -12/16 from dotted line to dotted line. I just measured from dotted line to solid line and I get 7/16 so that is just shy of 1/2″ Obviously my scaling to 100% is not working. Can you say more about how to print the pattern? I’d really like to try making this block into a quilt. Thank you again for sharing your creative skills and energy, I really appreciate it. I know I’m a bit late but I love this block and have saved it. Hope you are better from whatever was bothering you way back then and can sew more now.